Standard room (one king or two queen beds) $115.00 per night plus applicable hotel tax. King extended suite (1 king and 1 full-size pullout bed): $129.00 per night plus applicable hotel tax. Two-room king suite (1 king and 1 full-size pullout bed): $149.00 per night plus applicable hotel tax. Note: 17% lodging tax not included in above rates. 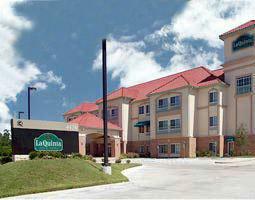 The LaQunita Inn & Suites offers a complimentary breakfast for all guests. You must mention "Chafer Pastors' Conference" when making your reservation to get this special conference rate. Transportation will be provided from the LaQuinta hotel to the conference and back to the hotel each day of the conference by volunteer drivers. Super Shuttle furnishes affordable transportation to/from both Houston airports. For reservations contact www.supershuttle.com, 1-800-Blue-Van (1-800-258-3826). Just follow the "ground transportation" signs at the airport. Please make sure you furnish them with the address of the hotel or your destination. Note: We are unable to provide volunteer airport pick ups or drop offs.